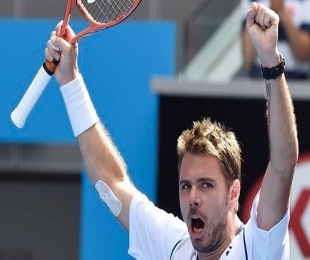 Melbourne: Defending champion Stan Wawrinka avenged his early exit at last year's French Open with a 7-6(2) 6-4 4-6 7-6(8) victory over Guillermo Garcia-Lopez on Monday to book his place in the Melbourne Park quarter-finals. The fourth-seeded Swiss lost to Garcia-Lopez in the first round at Roland Garros in 2014 and did not have it easy against the 31-year-old Spaniard this time around either. Wawrinka had to overcome a 5-0 deficit in the fourth-set tiebreak and saved five set points with some booming returns before setting up a clash with either Kei Nishikori or David Ferrer in the last eight. There was a slightly embarrassing moment for organizers in the first set when the match had to be suspended for several minutes as water dripped from the roof of the refurbished Margaret Court Arena. Court, the 24-times grand slam champion, had earlier attended the arena's official opening ceremony.